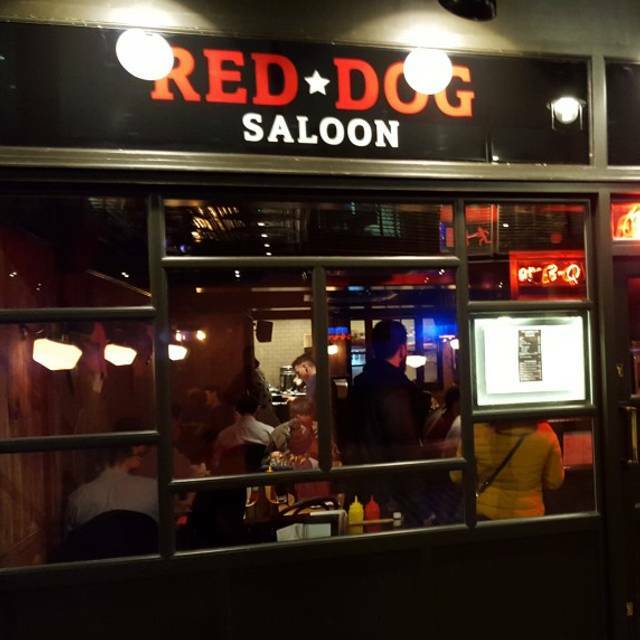 You must make bookings at least 5 minutes in advance of the time at Red Dog Saloon Soho. 8 minutes walk to Oxford Circus or Tottenham Court Road Stations. 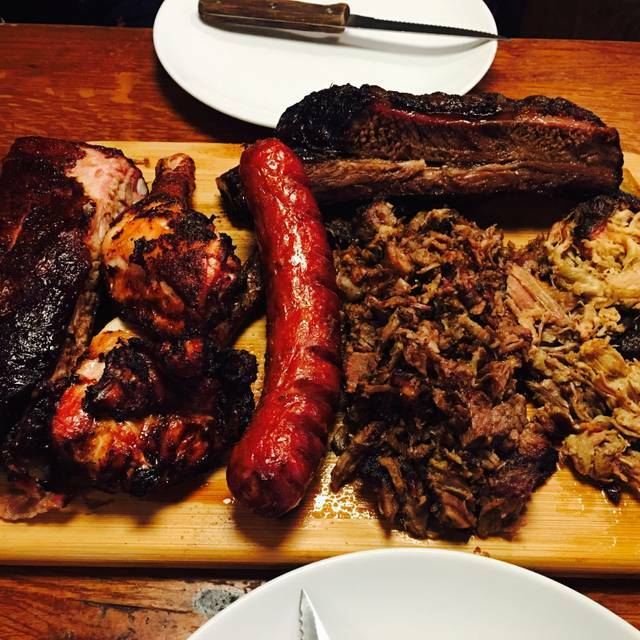 Barbeque grew up in the South of the USA where cooks learned to slow roast cuts of meat over fire pits to make them tender. Exposure to the smoke of the smouldering wood added a distinctive smoky taste to the meat. The process could take many hours, leaving the meat tender and juicy. Our award-winning smokers have been imported from the USA and are built to recreate the cooking process of those original fire pits. 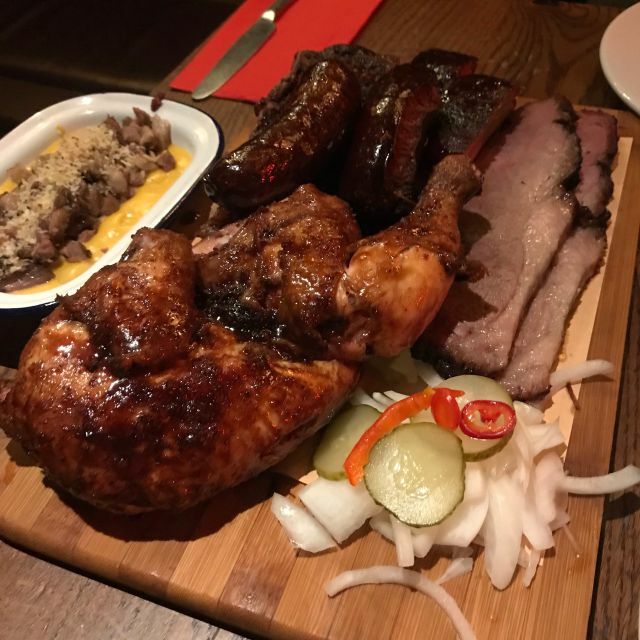 We smoke for up to 16 hours using the traditional American woods of hickory and mesquite to give a full smoke flavour. Great food, good service, just all round an amazing place to go for dinner and a few drinks. I really enjoyed the food and the service. I personally found it very loud when we were in, this wasn't volume of noise from hustle and bustle it was more the background music that wasn't in the background. The food was okay, several of us had "special" burgers and they were very nice, one of our group had a cheeseburger and that wasn't very exciting by all accounts. The staff were over attentive and kept coming over to ask if everything was okay, which it was.....but either 2 or 3 staff came over independently. It would have been better if just one member of staff had dealt with us and then not come over several times. It wasn't a bad meal, but for the price I feel I would have expected a little better. Food was almost perfect. The meats were cooked to perfection as were the fries. The mac and cheese and the slaw were decidedly odd in both taste and texture. However the restaurant did the right thing and took them off the bill when we said we didn’t want to pay for them after the initial taste. Would def go back again to try the cocktails and the smoked sausage again. No one can eat the amount of chips that were delivered in this portion size, and at 6.95 this could reduced in half both cost and portion. Chips were cold and I waited 15 minutes to pay the bill, service charge was included hence no tip left. Absolutely terrible service. We were told there was no table available for us even though open table confirmed our booking. When we turned up, we were seated by the front door, which was broken and letting cold air in. We asked to be moved as there were around 4-5 tables empty, and told they were reserved so we wouldn’t be allowed to sit there. Never experienced such bad service and the attitude of two staff members in particular was horrendous. Would not recommend anyone to go. Great food and plenty of it which offset premium prices Service was good too. We booked a table for 5 people and were given a table more suitable for 4. It was a booth style table, very narrow considering side dishes we ordered and drinks, it was very cramped. We aske s few times if the heating could be turned down or off but it always seemed to come back on, being a small restaurant and the number of guests in there, heating wasn’t required in our opinion. The female waitress didn’t notice we came through the door as she was on her phone and had to be prompted by a colleague that we were waiting to be seated. The same waitress also forgot to get our 2nd round of drinks so we had to remind her. Food was good, ambience but the service and table we were given could’ve been better. The hot wings saved the whole evening, they were the only thing I will take from the night. The service was very slow and when ordering drinks they would take so long to bring them to the table or at one point, just not bring them at all. It wasn’t busy enough for things to take so long. Do NOT order the Long Island Ice Tea, it was basically a glass of cola and lemon juice, no Alcohol involved. The cheese steak wasn’t as I had expected, smothered in cheese to the point you couldn’t taste or see the steak and when you did it was very dry and chewy. They kept turning the lights off during the meal, so you’d be eating in the dark and then bright bright shocking light all of a sudden. It’s such a shame because the restaurant in shoreditch is so lovely, this one doesn’t seem to match up. And it cost us £108 for two people. Still wishing I didn’t pay the 20% service charge, as there was no real service. 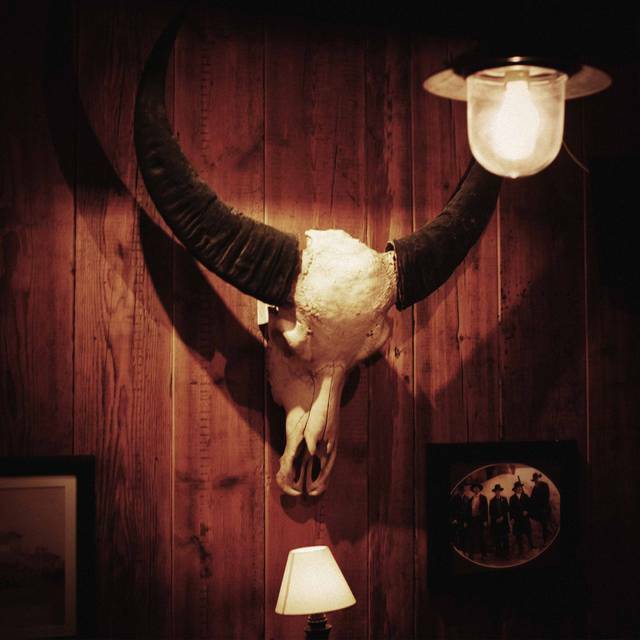 Have been to Hoxton Square location and had some great meals there. This one, I was disappointed. First time at the Soho one. Ribs were tepid. Not good when your eating ribs that generallly carry a fair bit of fat for flavour, etc...it just doesn’t taste right if they are just luke warm. 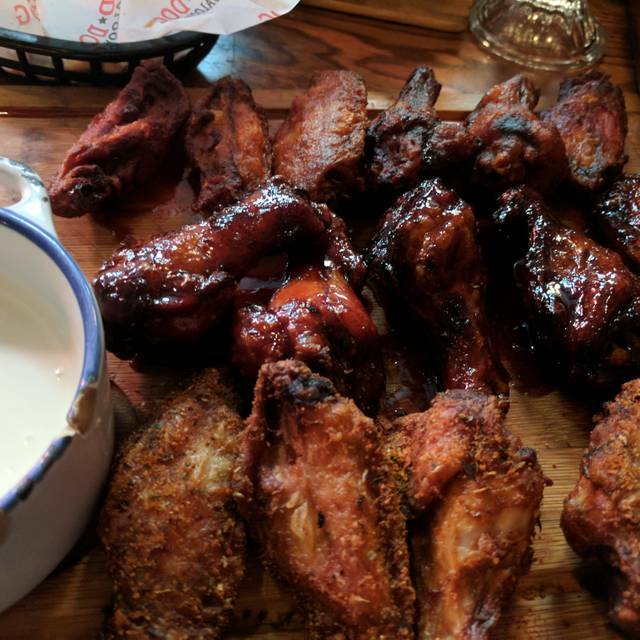 The wings that came on same plate were good temperature so I suspect they had the meat on the plate and were waiting for the wings to be ready before bringing it all out. Fries and onion rings were okay. I liked the unlimited ice tea, that was a nice touch and the flavour was decent. I left one of the pork ribs because of the temperature issues and didn’t reallly enjoy the rest, but I was with good company so I just chowed down as best I could! IF I went again they would need to seriously step up their game. Absolutely terrible waitress ruined our experience. Half the menu not available to order. Instead of politely pointing out what was available, the waitress was incredibly rude and unhelpful. So rude that we left without ordering. Great American style food, but we had thought given the name that is would serve hot dogs! 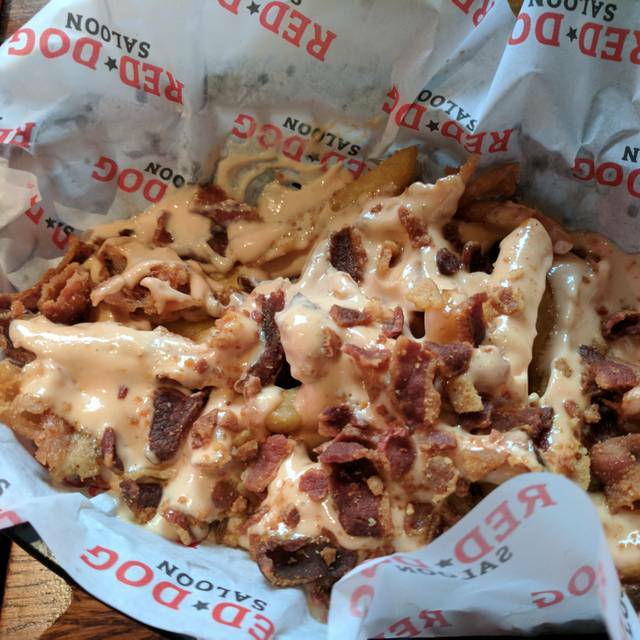 Despite that, kids and adults found some good food and we loved the loaded fries. Really great food was really quiet but was due to the time of day , have been when busier and that's added to the atmosphere. Food really good, hot, tasty and plentiful. Nice selection of beers and cocktails all in all a good American BBQ experience. On arrival it became apparent that they had made a mistake with our reservation and there was no table available for the initial time of our booking. Luckily after a few minutes one table finished and left, which staff quickly cleared and set up for us. The staff were very friendly, helpful and the service was brilliant. Our order was taken quickly and the wait until getting the food wasn’t long at all. The only issue with the venue is the toilets, or should I say toilet. There was only 1 toilet to serve all those visiting the restaurant. It was filthy and very unhygienic. The floor was covered in water or some form of liquid! This needs addressing. Over all a pleasant dining experience. Well nothing with smoked sausage was available as they hadn’t had the delivery. After we ordered a milk shake we were told the blender had broken down so that was a no go. Nothing off the bill to reflect this. Servers were nice enough. Once food arrived it was delicious. Had to wait 25 mins to be seated, was told my booking was later when it wasn't, they then says it was just busy. Food was okay though. Everything was really good. The portions are huge and the food is really tasty. The only downside is the place is so small, on a busy Friday night you’re packed in and it’s not the most relaxing of experiences. The love has gone. The food is Ok but massively overpriced for what it is. Either become amazing and earn the price you're charging or lower your prices to match the value of the food. 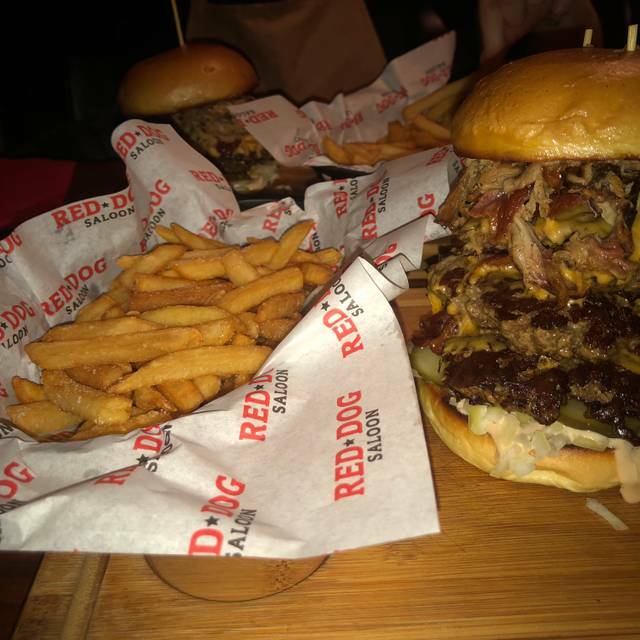 Always a good time at the Red Dog, the food as ever is always top quality and the whole place us just great !!! We booked a table for 6 and were sitting at the table for a while before the waitress decided to acknowledge us. This continued the whole night as we had to fight to get attention if we wanted extra drinks or to tell them that a side that was ordered hadn't arrived well into our meal. We decided to leave without tipping because of the lack of service we received, we would have been fine if the restaurant was busy but it was almost empty for a Saturday night. Really tasty food but rather pricy. Would recommend as a treat. Wow what a great place! We went to the soho location and our server Terry couldn’t have been nicer such a gem and Lilly was so lovely as well, the food was fantastic making it a fab experience, the only let down is that you don’t get anything with your burger and I would have appreciated having at least some chips with it instead of a lone burger on a board. Ordered sausage as an extra, wasn't told until food came out that their wasn't any sausages and I was still charged on receipt. 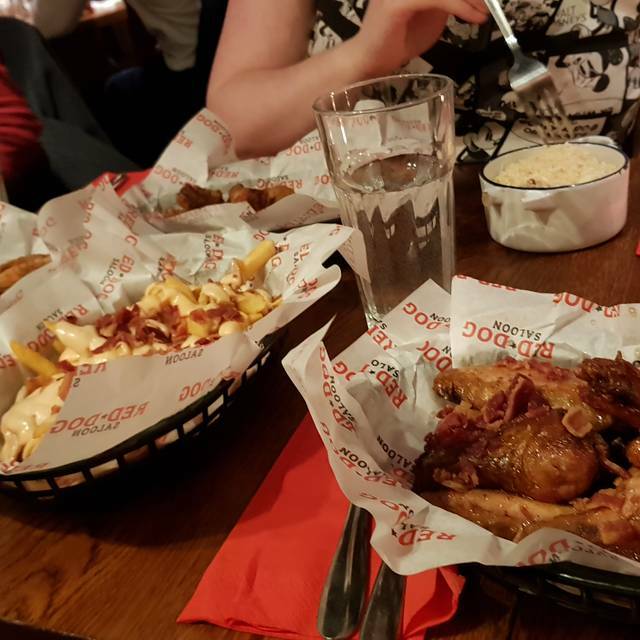 Onion rings were cold and the pink chicken was questionable, was told they'll speak to the manager but never did, when I eventually did he was nice and apologetic. Food was very very good. Waiters were poor very tight tried to put us right next to the door before I asked to be moved they put us on a table in the middle of the restaurant kept being bumped into by everyone walking past. Waiters were clueless and useless to be honest. I have been to red dog before but would give this one a miss. Good food and good atmosphere! Food could have been served hotter for my liking but overall great place to eat. Amazing. Seriously good food and a better than reasonable price! Just go there! Is this a destination restaurant? Probably not. 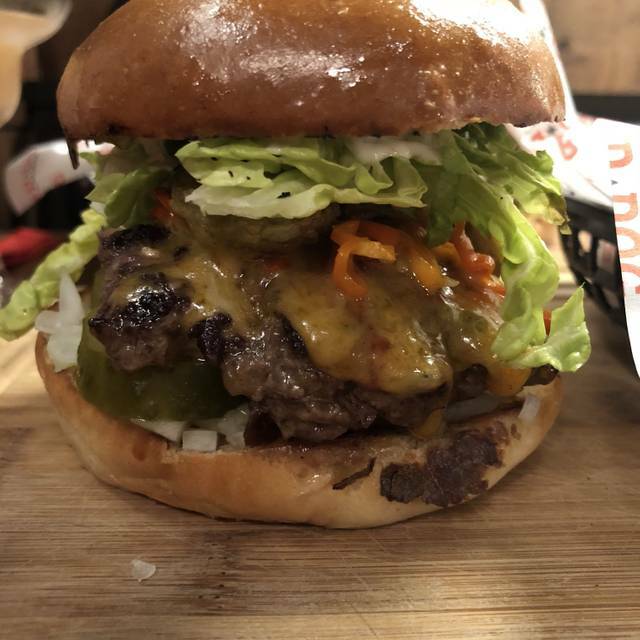 However if you are looking for a great burger, possibly the best I’ve had this side of the pond, without breaking the bank, then this is definitely worth a stop.